The coveted neighborhood of Beach Tract/Fairway Homes is located at the northernmost point of Pacific Grove and encompasses prime oceanfront real estate along Pacific Grove Marine Gardens Park and Lovers Point. 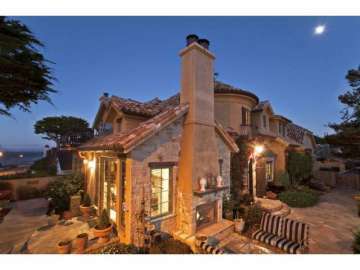 This desirable coastal enclave of homes is bordered by Ocean View Boulevard along the coastline to the North, Lighthouse and Bayview Avenues to the South, Asilomar Avenue to the West and Lovers Point to the East. Homes along Asilomar Avenue have western views of the Pacific Grove Golf Course. Fairway Homes are primarily ranch style homes situated along the golf course while homes closer to the shore can be quite dramatic in architecture and design from Spanish Style to contemporary to sophisticated modern and offering commanding views. The shoreline is picturesque and romantic with rocky shores, windswept cypress trees, cobalt blue waters and bursts of pink flowering plants that trail over the jagged rocks, and were planted to attract the migrating monarch butterflies the town welcomes each year. The neighborhood is excellent for enjoying the beauty of the coast, endless recreation opportunities and wonderful walkability to scenic spots, golfing and downtown shopping and dining along charming Lighthouse Avenue. The neighborhood is situated along the coastline of the Pacific Grove Marine Gardens Park which is one of 4 marine protected areas on the Monterey Peninsula, and is located between Asilomar State Marine Reserve and Lovers Point State Marine Reserve. A natural treasure, this stretch of coastline provides a sanctuary for a diverse variety of marine life including otters who seek shelter in the dense kelp beds. In fact if you hear a knocking sound you will often find an otter diligently cracking a crab with a rock as he reposes on his back, amusingly unaffected by the waves that roll underway. The ever changing bay views will capture your imagination with passing ships and sailboats, active marine life, dazzling sunsets and cozy foggy mornings that give way to dazzling blue skies and water. Click here to view all homes for sale in the Pacific Grove neighborhood of Beach Tract/Fairway Homes. For all available Pacific Grove real estate, click here. 25 homes sold in this neighborhood in 2018. The most expensive home to sold for 3.18 million and was located on Ocean View Boulevard and featured 3 bedrooms, 2.5 bathrooms, 2,689 SqFt of living space on a 11,326 SqFt lot. The least expensive home sold for 765K for a 1 bedroom, 1 bathroom, 416 SqFt beach bungalow featuring Ocean views and just steps to the recreation trail. 15 homes sold in this neighborhood in 2017. The most expensive home sold for 3 million for a 6 bedroom, 7 bathroom, 4,343 SqFt home on Ocean View Blvd on a 10,336 SqFt lot. The least expensive home sold for 469,500 for a 2 bedroom, 2 bathroom mobile home located in the Monarch Pines community with 1,152 SqFt of living space. In 2016, 15 homes sold in this neighborhood. The most expensive home sold for 1.75 million for a 4 bedroom, 2 full and 2 half bathroom home with 1,978 SqFt of living space on a 7,400 SqFt lot with views of the Bay. The least expensive home sold for 825K for a 3 bedrooms, 2 bathroom, 1,712 SqFt home on a 11,282 SqFt lot with views. 32 homes sold in this neighborhood in 2015. The most expensive home sold for 2,536,500 for a 3 bedroom, 2 full and 2 half bathroom beautiful home with 3,768 SqFt of living space on a 6,300 SqFt lot. The least expensive home sold for 449K for a 3 bedroom, 2 bathroom, 1,741 SqFt mobile home located in the 55+ community of Monarch Pines. In 2014, 11 homes sold in this neighborhood. The most expensive home sold for 1.68 million and featured 3 bedrooms, 3 bathrooms with 1,959 SqFt of living space on a 6,300 SqFt lot. The least expensive home sold for 615K for 2 bedrooms and 1 bathroom, 936 SqFt of living space on a 5,000 SqFt lot. In 2013, the most expensive home sold in the neighborhood was a 2,200 SqFt home on a 4,200 SqFt lot, which sold for 1.665 million, while the least expensive was a 1,100 SqFt home on a 6,400 SqFt lot, which sold for 615K. In 2012 there were 28 home sales in the neighborhood of Beach Tract/Fairway Homes. The most expensive home sold for 2 million and was a 3 bedroom, 2+ bathroom Ocean view home with 3,332 SqFt of living space situated on a 4,800 SqFt lot on Balboa Avenue. The least expensive home sold for 479K and was a 798 SqFt duplex located on Mermaid Avenue with 2 units each with 1 bedroom and bath. Built in 1934 it was located on a small 1,500 SqFt lot. To live in the Beach Tract/Fairway Homes neighborhood is to live in Pacific Grove’s premier neighborhood. The beauty of the area is captivating and the lifestyle is active, relaxed and in touch with the natural splendor of the coast. You will enjoy morning jogs along the recreation trail with the invigorating sea breezes and cycling along the endless stretch of coastline into Monterey or along 17 mile drive into Pebble Beach. With Pacific Grove Municipal Golf Course in your backyard any time is tee time for experienced golfers and beginners alike. Those who enjoy watersports will take advantage of surfing, paddle boarding, kayaking or scuba diving and photographers will find unlimited opportunities to capture beauty and life through their lens. Of course relaxing at home is a wonderful option and you will enjoy the green golf course views and tranquil bay vistas. Exploring Pacific Grove on foot is an enjoyable way to spend the day and entertain friends and family. With more Victorian homes per capita than anywhere else, you can admire the historic homes with their colorful palates and gingerbread details. Lighthouse Avenue is just a short stroll away where you can experience fine dining at Passionfish, Fandango or Le Normandie. Mornings, arrive early to grab a spot in line and savor a perfect croissant or scrumptious pastry at Pavel’s Patisserie along with a hot cup of coffee from local roaster, Carmel Valley Roasting Company where you can sit outside as you read The Pine Cone local newspaper for happenings around town. Pacific Grove holds several parades throughout the year, festivals and car shows giving residents and visitors a truly hometown experience. Of course your central location in Pacific Grove also gives you excellent proximity to enjoying historic Monterey, the story book charms of Carmel, and the golfing mecca and visually stunning Pebble Beach. Recreation, relaxation and world class experiences are yours when you own a home in the premier Beach Tract/Fairway Homes neighborhood of Pacific Grove.